Discussion in 'RAC & RTR' started by Old Git, Oct 5, 2012. 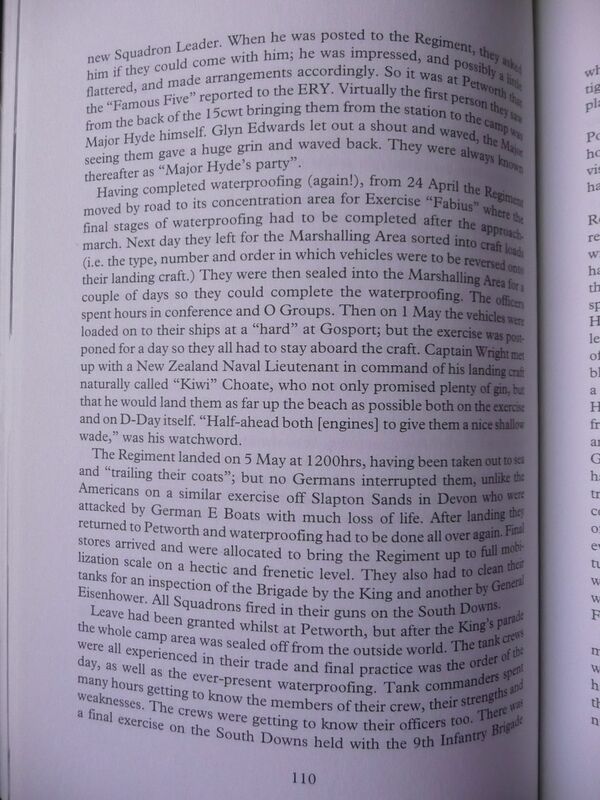 As per the subject line I'm seeking copies of the diaries of of these three units for the period April- May 1944. They are all 27th Armoured brigade! If you need help getting copies of them then give me a shout. I've got two of the three histories above. I'll post the pages later if you want? I'd be happy to pay you for them relevant pages mate, which ones have you got already? As I say I only want April/May for these units so don't need the full diary. I'm also looking for the diary for 107th RAC for June/July if you happen to have it? 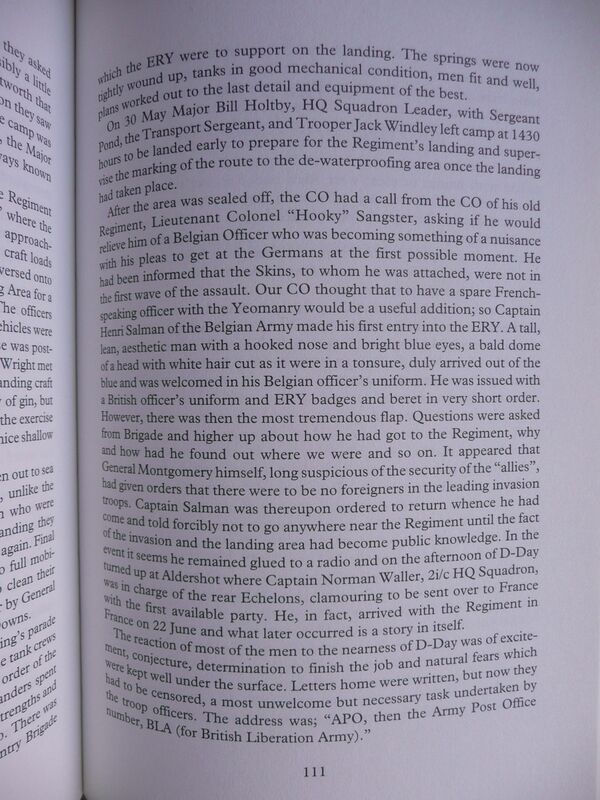 I have the 13/18 Hussars and East Riding Histories. I'll photograph and post the pages later. I'd wait to you see them first, they may not be any good There's only a couple of pages in each so you may still be better off getting Lee to copy the months for you. Thanks for the heads up Andy but I'm not looking for too much from them to be honest, just a hint or a nudge in the right direction. I shall let you know if they've been useful or not. 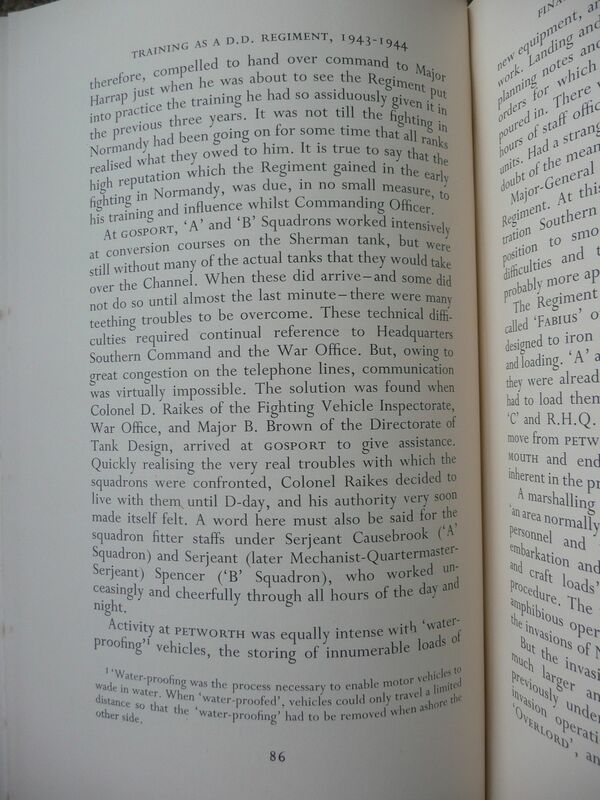 Here is the war diary for the 13th/18th Hussars for April and May 1944 (Logs only I'm afraid). Mace, Paul. 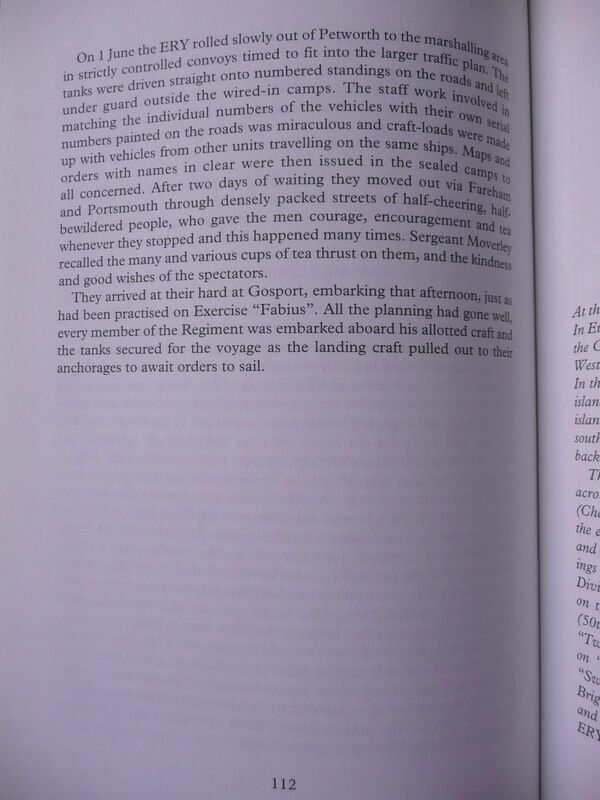 Forrard: The Story of the East Riding Yeomanry. Barnsley, Yorkshire: Leo Cooper, 2001. 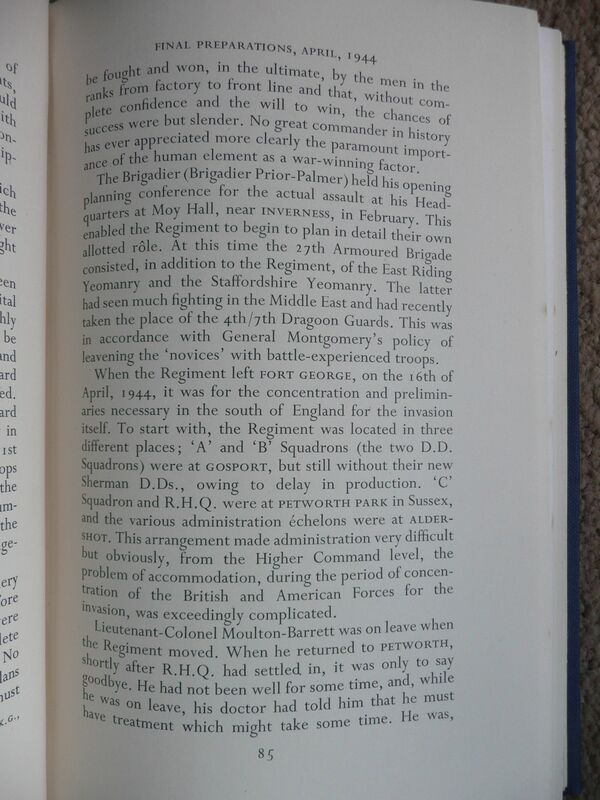 The Staffordshire Yeomanry came under command of 27th Armoured Brigade the on February 14th at a camp at Gordonstown near Elgin. The final Shermans were issued in March 1944 at Haywards Heath and the regiment was up to a full establishment of Shermans with AA Crusaders in the AA Troop and Stuarts in the Recce Troop. 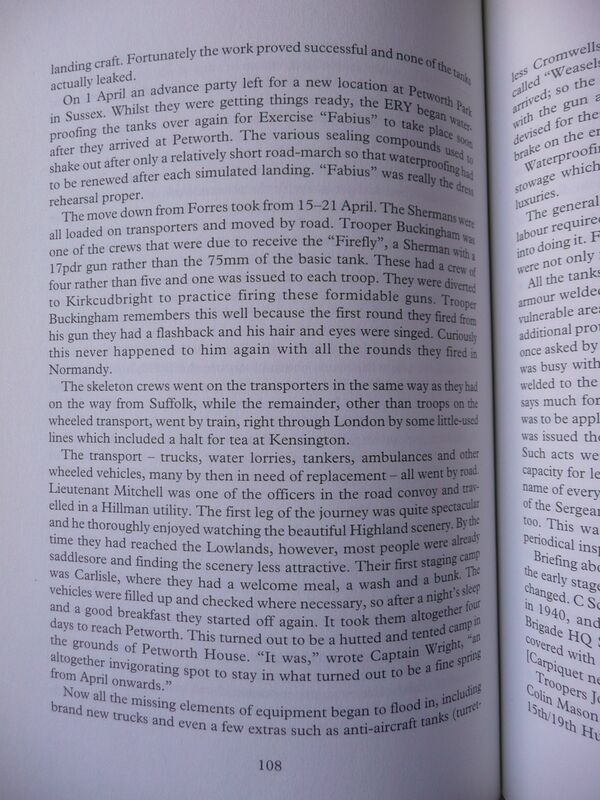 The brigade then concentrated in the Lossiemouth area and began to train with the 3rd Infantry Division. The Staffordshire Yeomanry was assigned to support the 185th Infantry Brigade with ‘A’ Squadron under the 1st Royal Norfolks, ‘B’ Squadron under the 2nd Warwicks and ‘C’ Squadron under the 2nd KSLI. 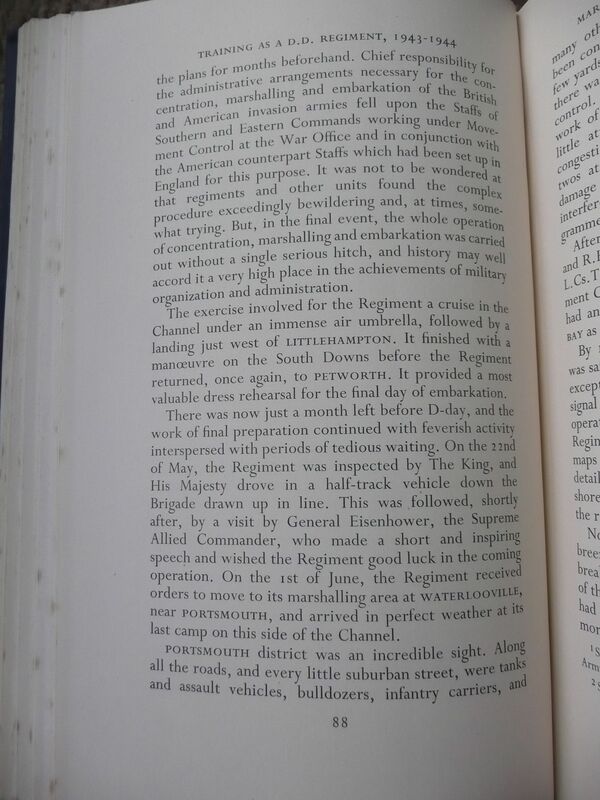 After the exercises with the division, the brigade moved to Haywards Heath, Sussex.The regiment sailed on June 5th, 1944 and landed in Normandy on June 6th, 1944. It fought at Caen, Lebisey Woods and Bieuhart on the River Orne. After these actions it concentrated in the area of Colombes, where the brigade was broken up. When the 27th Armoured Brigade was broken up the regiment handed in all remaining tanks on July 26th, 1944 at Colombes. On December 30th, 1943 the 151st Regiment, RAC was retitled 107th Armoured Regiment, RAC on disbandment of the 107th Training Regiment (King’s Own), RAC. It was equipped with Churchill tanks along with Stuarts in the Reconnaissance Troop. 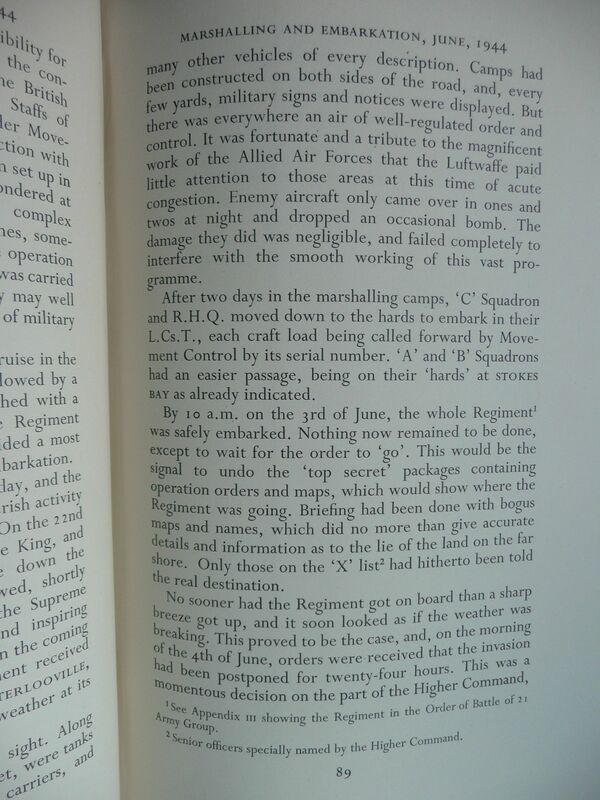 In May, waterproofing of the vehicles was carried out in preparation for their movement to France but it was not until 20th June that the vehicles were moved into marshalling areas to go across the Channel. The regiment left the United Kingdom for North-West Europe on July 2nd, 1944. It landed in France the following day. The 107th was involved in the Battle of Caen, at Hill 112 near Esquay, south west of the city and following heavy fighting at Grimbosq and Brieux on the 7th and 8th of August crossed the River Orne and concentrated to the west of Falaise for reorganisation. The regiment absorbed 153rd Armoured Regiment RAC on August 24th, 1944 as ‘C’ Squadron. The new 107th RAC served at Le Havre and in the Nijmegen corridor. In October 1944 in attacked St. Leonard under command of 49th Infantry Division and was located in the Rhine area in December 1944 under the 15th (Scottish) and 43rd (Wessex) Infantry Divisions. Thanks a lot chaps, (Dryan, Andy, et al) all splendid information, I shall print it off and read my leisure!!! 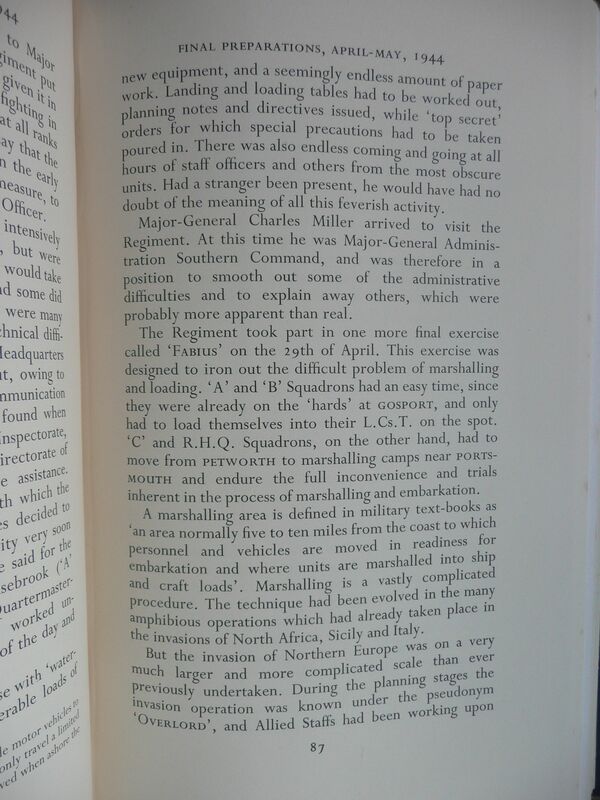 Andy I presume these pages are from a history of the 27th Armd Brigade? Can you let me know the name and Author? Hi Drew, many thanks for the goldmine of information you regularly provide in these forums, can I please trouble you for the titles of the books scanned above?